Few days ago Indian Home Minister Sushil Kumar Shinde confessed in a conference that Hindu Terrorism is a fact and parties like BJP and RSS are training Hindu terrorists to attack Muslims and other minorities. 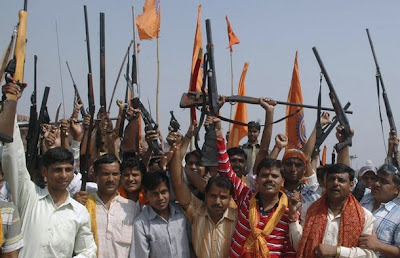 Shinde admitted that these Hindu terrorists where involved in Samjhota Express and Makkah Masjid attacks as well. In Samjhota Express attack 65 Pakistanis where killed. India's foreign minister Salman Khurshid has also agreed with the comment of Home minister. Salman Khurshid said on Tuesday that i agree with the comments of Home Minister. these comments by Home Minister and Foreign Minister of India proved once again the dangers for Muslims and people of other religions who are targeted again and again by Hindu extremist groups. The situation is dangerous also because BJP is not a small party but its the main opposition party of India which also came in Government once. Acts of terrorism by party like BJP is pointing towards real dangers for minorities in India.